this is a beautiful and luxury patek philippe, it was belong to a royal family in my area, This is a wonderful 18k white gold Patek Philippe Elipse wristwatch with attached 18k band( non patek) in EXCELLENT CONDITION! this is a manual wind model. It is app. 26mm X 32mm, and has the original Patek Philippe crown. The dial reads: Patek Philippe Geneve Swiss. The movement is the original Patek Philippe manual wind, and is marked: Patek Philippe & Co. Geneve Swiss Adj. to Heat, Cold, Isochronism & Five (5) Positions Eighteen 18 Jewels 23-300 PM. The movement is running, and keeping time within app. 2 seconds per day. Inside the case back is marked: Patek,Philippe &co Geneve Swiss 18K 0.750 268 3671 3546. The total length of the watch is 7 1/4". Buckle has a clasp with safety closure inside. 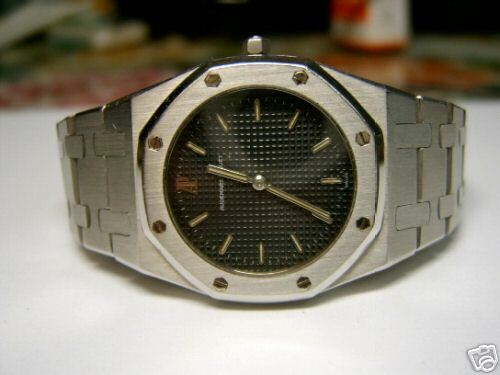 This watch is in incredible condition-it looks like it was just put away and never worn. don't miss!